I'm sure many people have their own special way of making garlic bread. I usually make a compound butter with softened unsalted butter, fresh and dried herbs (oregano, thyme, rosemary, basil, tarragon, etc) and minced garlic. This is then spread onto french bread halves and baked until toasted. This time around, after toasting the bread, I sprinkled a trio of mozzarella, asiago and provolone cheese on top and baked it in the oven until it melted into cheesy deliciousness. Mmm... cheese always makes things better! In a bowl, combine the butter, garlic powder, roasted garlic, salt and parsley to create a compound butter. Spread the butter on each bread half and bake in the preheated oven for 5-7 minutes until slightly toasted. Meanwhile, combine the shredded cheese in a bowl. Remove the bread from the oven and top with the combined shredded cheese. 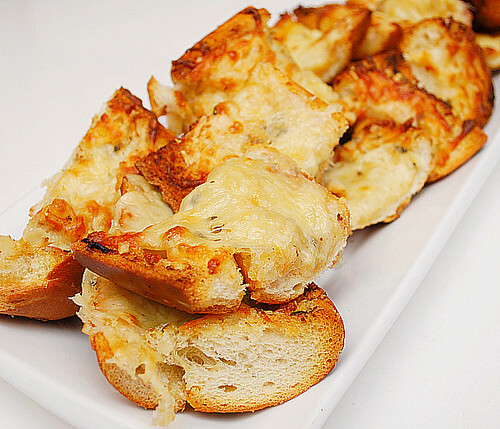 Place the cheese topped bread halves back in the oven and bake until cheese is melted. Serve hot. * To make ahead/freezer meal - Prepare the compound butter as directed above and spread on each bread half. Wrap bread in foil and freeze. When ready to prepare, bake in preheated oven as noted above. Remove bread from oven and top with shredded cheese and continue baking as directed above. I love the mix of cheeses on this cheesy garlic bread. I have to admit it's been a VERY long time since I've had garlic bread, but this looks absolutely fantastic. Oh, My!! My husband will be mad. There is now drool on the keyboard. Maybe he will forgive me if I make this bread??!! Would love to hear what other herbs you like to use on your garlic bread. 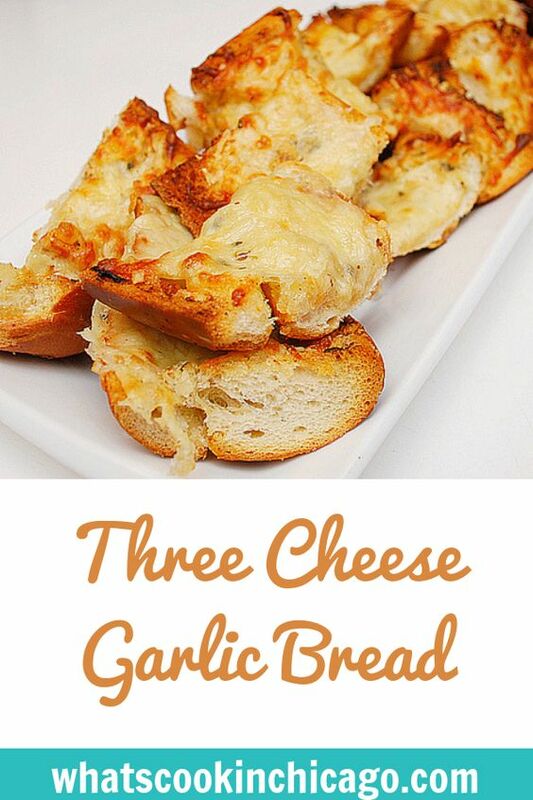 Mmmm to three cheeses with garlic bread. For a suprise yet fresh tasting "zing" try adding a little lemon juice to the butter/garlic/herb mixture - then get the lucky "eaters" to guess the new ingredient. Thanks for the amazing recipe. This is now my go-to recipe for garlic bread. Especially since it's so easy to make a bunch ahead and freeze. I freeze it with the packet of cheese in it so I don't have to worry about having cheese on hand when I decide to make it.